When I first encountered ticks on our animals, ignorance on my part and a certain squeamishness meant that I went to the vets to deal with it. I know, I know.... I have come a long way. My various searches of the internet didn't help particularly as they just weren't clear enough and were full of dire perils like not leaving the head in. The other issue was what exactly to use. This little gadget has been the most effective in my opinion. Being steel (easily washable), good grip for fingers and strong I felt much more in charge of this little operation - which I am sure is conveyed to the animal. 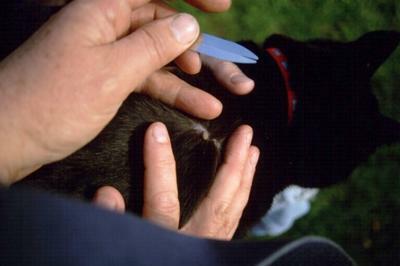 The 'v' of the remover can be slipped with a little pressure under the tickhead along the skin and the tick will finally have to release its hold as the gadget moves totally under the body of the tick. I took these photos meaning one day to share them with other people who may be a bit like me. Hi Susie... Thanks for the nice tip. Please tell us the name of the device and where you got it. Are ticks commonplace in Spain? Susie has pointed me in the direction of this device: Pro-Tick Remedy II Tick Remover. Avoid Tick Bite First , Be Aware - Protected- Prepared. I have to say we bought ours in UK but I have just googled this product and American people will probably know this company quite well. I found a camping company selling this gadget at $3.99. Our animals used to pick up ticks in the fields around our previous home in Hampshire UK. I notice the farmers dont bother with their animals - maybe for obvious reasons as the costs of protection are quite high. They just let the ticks feed on outside animals and they will fall off after a feed. We are luckily not surrounded by deer here although the odd one might accidentally pass by. However when I visit Virginia everyone has to get sprayed and covered up because of Lymes Disease and my young nephew is recovering from this awful problema as I write. Also my daughter and her partner have a small-holding in Austria and have deer all around them. Cutting grass recently they were both bitten by deer tick necessitating a visit to the doctor for treatment. After treatment they are going to be vaccinated against future risk.